After a long work week, a very long day, and a longer drive, we arrive just before 11 to the dark house. My sister is still in her car when we pull in the driveway behind her. Too sad to open the front door and face the emptiness. But together we go in, and together we begin to sort through all that’s still there. Our mother made an inviting home for all who visited. A god-daughter stopping by for a luncheon. Her sister up from Philadelphia for the weekend. Dinner parties with old friends and new. Holiday meals and birthdays. All reasons for her to arrange flowers and light candles along her dining room table. My daughter was a summer-long guest while she took on a NYC internship; my youngest son stayed for the whole year after college as he found a job, himself, direction. And always her six coming and going, stopping by to enjoy her hospitality. This, her last home, is imbued with bright sunshine, streaming in all afternoon, as well as reflecting from the yellow walls and warm-toned furnishing. She was, however, a rolling stone, often on one of her trips. Only in “her pad” (as she referred to her home) here and there. She visited us in Vermont, other children and grandchildren in California, her siblings in Florida, traveled across Europe, exploring the National Parks, Alaska, Egypt, even the Panama Canal. Kept moving that one. On Saturday we wake early, dash about, reeling like at a garage sale of memories; we pack up the last of her, even though I still see her reflection in the mirror over her dresser as she pulls out a well-worn cashmere sweater from the third drawer. Funny how I can still remember where she kept what, even though her clothes are folded in piles across her bed now, and it’s been decades since I even looked in those drawers. But now we empty kitchen cupboards and cabinets, drawers and closets, making piles for what goes where, the whole of her boxed and sealed, made ready to be transported elsewhere. How can one laugh while undertaking such a sorrowful task? In my mother’s joyful home, how could one not? So we do. At the end of the weekend, we each drive away with carloads of her, off to our separate homes, carting simple objects made priceless by memory. What follows this paragraph was posted in November of 2012. For those who were lucky enough to have visited my mother’s home or for those of you who read this blog way back then, I hope this post is a sweet remembrance. For the rest, I invite you in for a glimpse of her home as it was, before, yes, before she was divided into neat piles; for, as we have come to say, mom is everywhere. Indeed. Like 42.5 million other Americans I traveled more than 50 miles “home” for Thanksgiving, and like so many, our gathering was in a different house than the one I grew up in. My mother sold the big family home and now lives comfortably in a sunny condo. 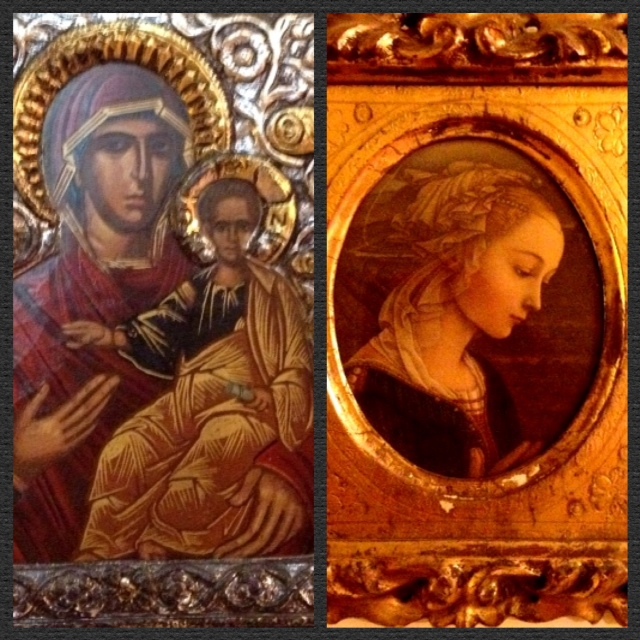 Luckily, many of the artifacts from my childhood settled in as well as she has, including her collection of Madonnas. 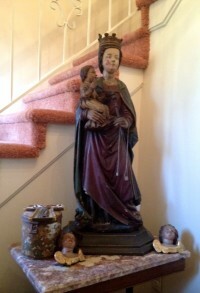 Directly inside my mother’s front foyer, a 13th century Madonna greets all who enter. This carved wood statue had been in our old family home almost my entire life, yet I only just asked my mother where it came from. I heard an elaborate tale about how my father discovered this treasure during a trip to Chicago. While there he walked past an antique shop and saw this Madonna in the window, but each time he passed the store was closed. Serendipitously, a massive snow storm left him stranded in Chicago for an extra day which allowed for a visit to the store while it was open. A price was negotiated and he had his treasure shipped back to New Jersey where for nearly fifty years she graced our den before moving to her present location. Along the hallway there are two miniature Madonna’s on the wall, each with their own unique story, and as I ask my mother she revealed all the fascinating details with relish. The short version? The one on the left she bought for herself while visiting Jerusalem in 2002, while the other came from her own childhood home, given to her when her mother downsized. 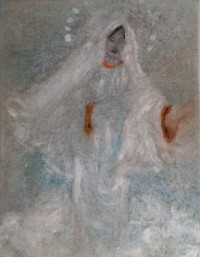 Heading up the stairs and down the hall to my mother’s room, residing over her bed, is the Venezuelan artist Federico Vegas Chumaceiro’s ethereal and lovely Madonna he created especially for her. The Chumaceiro and Vegas family friendship with mine goes back for decades, crosses generations, borders and languages; this painting stands as a testament from Federico’s heart to my mother’s. Halfway back down the stairs on a landing is a double fold painting of the angel Gabriel’s visitation to Mary. 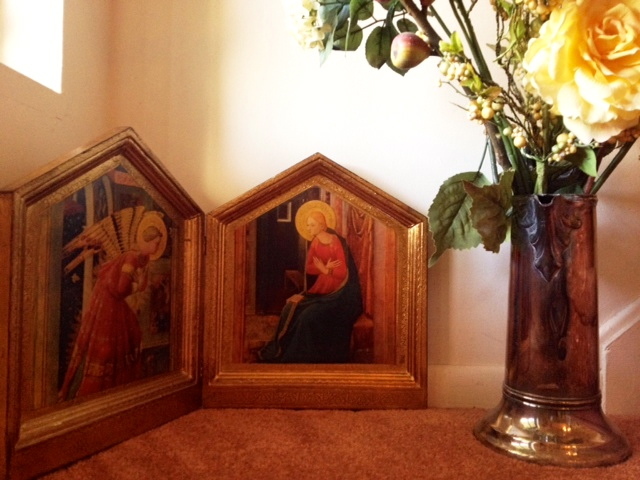 This gild framed reproduction came from a trip my parents took to Washington D.C. Before my quest to discover the Madonnas in my mother’s home, I’m not sure I ever noticed this one; I certainly didn’t know its origin or pause to have a good look at her but she’s a beauty. Finally is the Madonna my daughter, marnika weiss, painted while still an art student at MICA in Baltimore. She gave this painting to her grandmother for Christmas when she first moved into this new home, and she found a perfect location for it high above the door. On your way out she looks down to grace your departure in her warm tones and maternal pose; this canvas an labor of love. Listening to the stories and learning about the artifacts that grace your family’s home can make your holiday time together all the more special; knowing the origins grant the object even more meaning and attachment as unique as the family surrounding you. So glad to have had this time with mine. As I read this, I was flashing back to my mother-in-law’s house, which we cleaned out some months after her death. And to the time I did the same with my mother when my grandfather died. Your description of being in the bedroom, envisioning her pulling out an item of clothing “from the third drawer,” nailed me. Thank you for sharing this extremely personal moment. This is the aspect of grieving that we don’t hear about very often. But it is the most stark, palpable moment in the process we all go through – or are going through – as we say goodbye to our parents and loved ones. Thank you. I am so very grateful to reach others. Thank you for reading, and being moved to comment. It’s wonderful to have such lovely memories and to bring them back to your home. You are so right. Priceless memories will never die.